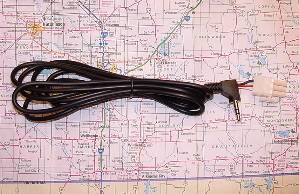 IsoSet is a ground loop isolator required to eliminate alternator noise when a bike powered stereo player is connected to the GL1800 auxiliary input. Connect the GL1800 Auxiliary Audio connecor (under left pocket) to IsoSet. Connect the GL1800 OEM (or KTG extender, see below) Stereo Harness to IsoSet.